The historic Matchbox factory - Lesney Industries Ltd - is going to be completely demolished this week. 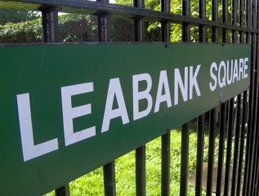 I know 2 separate residents here in Leabank Square who used to work there - and a whole lot more in the wider Wick. If you want to say your goodbyes to this iconic building - a few of us will be taking a few flasks of tea to the towpath opposite - tomorrow at 3pm. Even if you never worked there - you would almost definitely have pushed around a Matchbox car as a girl or boy. If you still have one or two - why not bring it along to show the rest of us. The Matchbox name started in 1953 as a brand name of this British toy company - Lesney Products (named after its co-founders Leslie and Rodney Smith), which had been founded in 1947 as an industrial die casting company. I know we are all going to welcome our new neighbours who will occupy the new creative/residential development - but it is still a sad time for some of us. Hackney Wick Flea Market a Great Success!! Hackney Wick bid a fond farewell to the Main Yard Gallery today with a great Flea Market. As we all know - the building is due for imminent demolition - and that's why it was lovely of Man Hon Luk to site one of his amazing Flea Markets in this gallery. There were many amazing stalls - but of course - we need to big up Isabelle and her delicious French (of course) onion soup. She did Leabank Square proud while Martin kept MartabelleK open for the rest of the Wick. I was particularly chuffed to bargain an amazing saw for the gardening club - Wow - thanks Dirk! Heaps of green volunteers are hosting a woodland management day around the corner at the Hackney Community Tree Nursery tomorrow. Steve and Annie are great friends of Leabank Square - and have donated many items for our gardens - so the least we can do is return the favour - and help out between 10.30am and 2pm tomorrow. So if you are interested in this lovely way to spend a Sunday morning - please meet at the Tree Nursery in Hackney Marshes. Just turn off Homerton Road - into the car-park where we all get our compost. On the right hand side you'll see the nursery. You will be amazed at what you can learn about coppicing, wood management, mushrooms, and of course - just how much more space is being taken away by the Olympic Juggernaut! We are currently in the midst of the annual fairtrade fortnight where all the great people, groups, charities and foundation, get together to promote the many invaluable reasons why we should all buy as much fairtrade products as possible. As a celebration of fair-trade fortnight, Hackney’s famous Arcola theatre has got together with the tower hamlets and hackney FT groups to present a free screening of ‘The Great African Scandal’. The film sees lecturer and broadcaster Dr Robert Beckford investigating Ghana’s economic poverty despite its natural wealth in minerals and stable democracy. Film goers will be invited to stay and chat after the film screening and enjoy a cup of Fairtrade tea or coffee and a slice of cake. 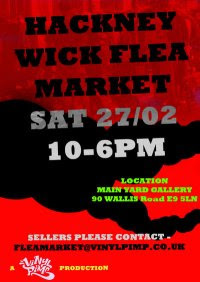 The next Hackney Wick Flea Market is on again this Saturday in 2 locations this time!!! 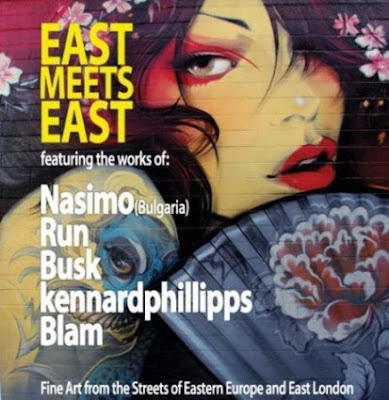 two markets in Hackney Wick this Saturday. continuous consumption of mulled wine. Have a brilliant New Year - especally all you tigers out there! It seems that - no sooner have we cleaned up the last lot of dumped rubbish - than the scumbags have been at it again! Please - everyone - please be on the lookout for whoever is driving into Leabank Square - and making our lives that little bit messy. All the cops want is the number plates - but if we can take a pic or two - without being caught - then all the better. If we don't get these people stopped - then it will only get worse. Help Clean Up our River Lea!! Towpath Tidy 2010!! We've just had a brilliant invitation to help clean up the canal with British Waterways. I know some of us have been invovled in these annual clean-ups before - but we need many more volunteers to help out this year. It is always a lovely fun-filled day - and we get to meet many more of our neighbours from up & down the canal! Felicity McClintock from British Waterways says: Hackney’s event will cover the stretch from Leabridge Road (Princess of Wales Pub) through to the towpath opposite you on Saturday 13th March. We are calling on volunteers to come and help us spring clean our waterways. Volunteers are needed to put on their boots and take part in British Waterways’ Towpath Tidy 2010 – coordinated activity days which will take place along targeted stretches of the capital’s waterways between Monday 1st and Sunday 14th March 2010. Everyone is welcome, with activities ranging from litter picking, planting, painting and graffiti cleaning, floating litter removal to cutting back towpath vegetation. to visit all Towpath Tidy listings and locations in the country. You may also want to follow Towpath Tidy on Twitter and Facebook. Please note numbers may be limited at some locations depending on works and facilities so it is important you let her know if you would like to join us. Come on Leabank Square - let's get the other side of the canal all cleaned up as well!! Overground Closes for 16 Weeks. As we said way back in October last year (http://leabanksquare.blogspot.com/2009/10/hackney-wick-station-closes-for-4.html) - our beloved Hackney Wick Station closes for 16 weeks from this Monday. It's one of those 'jam for tomorrow' stories - 'cos when it re-opens - we should have the best service of any line in London!! So please look at previous blog entries for very helpful hints during this time. Of course - we could all beg & borrow (never steal!! http://leabanksquare.blogspot.com/2009/12/my-wheels-have-been-nicked-help.html) a bicycle from friends & neighbours - and join about a quarter of the Square cycling around the Wick. During the middle of this week, the family decided to take an impromptu trip to the seaside. Brighton was the seaside of choice as we hadn’t been for so long and it’s convenient to get to, being only a short journey from Waterloo. Not many people would consider venturing out to the coast during one of the coldest London winters but a primal urge was calling us to be by the sea. All Londoner’s should make an effort to be by the sea at least once a year. In winter the sea air and sea views will distress and calm your London spirit. You will leave feeling relaxed, invigorated and soothed, even if you’ve only just spent a day there. But if you visit Brighton for no other reason than to see the natural spectacle of the Brighton Pier starlings, then this alone will make it truly worthwhile. It was nearing dusk and we were skimming pebbles by the beach, when we noticed a few faint black clouds in the crisp winter sky. As we observed the clouds intently, further black clouds blew in and merged together to form an enormous cloud that appeared to be moving in an erratic but fluid motion. We were totally enthralled and rushed up to the East Pier to take a closer look. We soon realised, that these smoky clouds were in fact a gigantic flock of starlings. There must have been tens of thousands of starlings putting on the most beautiful sunset dance for us. We watched and watched until the sun dipped below the sea and these amazing birds eventually took cover underneath the pier and settled in for the night. The show may have come to an end but as we walked across the pier we could still hear their noisy, chattering, bedtime conversations. Make Your Hackney Council Tax Work!! A couple of years ago, Maria gave us a brilliant website called FixMyStreet (http://www.fixmystreet.com/) to use to report any broken street lights, fly-tipping, dog poo,potholes, abandoned cars, graffitti, broken paving, businesses spilling out onto sidewalks, etc in Hackney Wick. Please use this amazing website to get more value for your council tax. All you do is report something you don't like around our streets - and they send it to the relevant department in Hackney Council - and keep reminding them to fix it - until they do. And today, José told the team cleaning up this weeks fly-tipping about a mobile phone App coming soon as well. It's called Citizens Connect - and it will do the same thing. Apparently - you can take a photo with your phone, send it in, and it will work out exactly where it is through some clever GPS software. Please don't assume someone else is going to do it, please just do it yourself, and then sit back & watch Hackney Council work on your problem. Thank you so very much to everyone in block 62 - 73 who turned out this afternoon to clear up the horrible mess dumped in front of our door. What would have taken us a whole day to clear up - was done in a couple of hours! Thanks to Matt, Adam, Wayne, Paul, Tony, Dee, Sóna & Nadira - who all really worked hard making the sidewalk and road clean and sparkly again. With neighbours like these, Leabank Square is a lovely place to live in.